Since 2001, the Research Group has jointly sponsored scholarly meetings, co-organized by Mildred Budny and held at various centers. 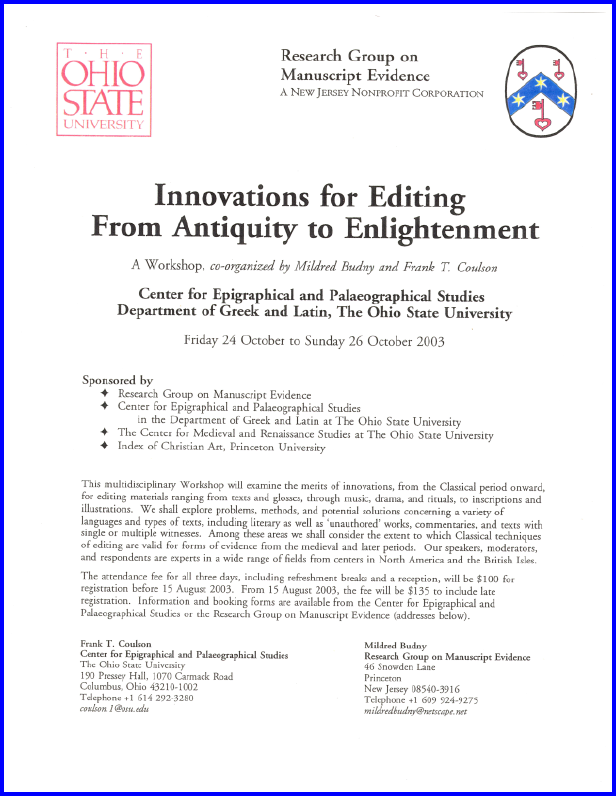 These events constitute the New Series of Seminars, Workshops, Colloquia & Symposia. 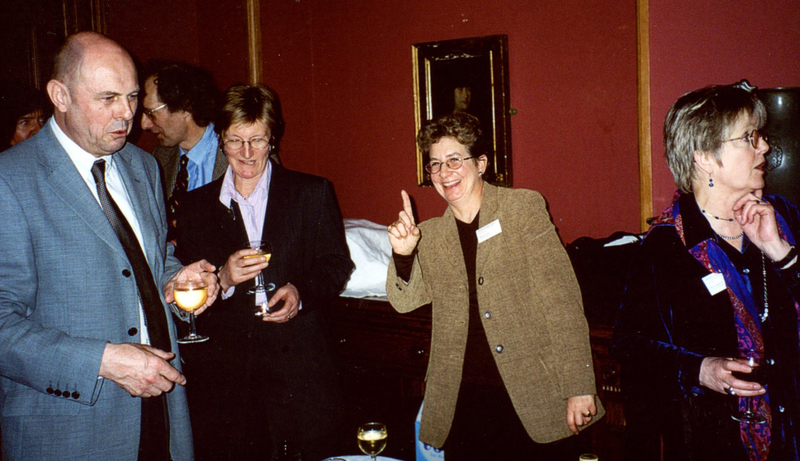 The Colloquium (sometimes also called a Workshop) was held at the Center for Epigraphical and Palaeographical Studies in October 2003. 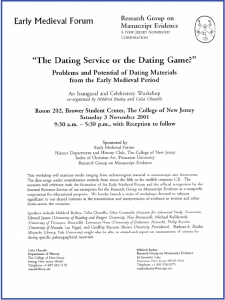 This multidisciplinary meeting examined the merits of innovations, from the Classical period onward, for editing materials of many kinds, ranging from texts and glosses, through music, drama, and rituals, to inscriptions and illustrations. The assembled experts explored problems, methods, and potential solutions for a variety of languages and types of texts, including literary as well as “unauthored” works, commentaries, and texts with single or multiple witnesses. 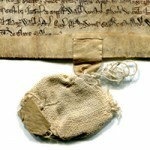 Among the areas of concern were the extent to which Classical techniques of editing are valid for forms of evidence from the medieval and later periods. “Will the Real Edition Please Stand Out? 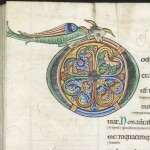 The presentation at the Colloquium reporting the CORPUS of Insular, Anglo-Saxon, and Early Anglo-Norman Manuscript Art represents part of the long-term commitment by the Research Group to this collaborative reference tool which catalogues, indexes, and illustrates the surviving manuscript art of the British Isles for the period 650–1100 CE. 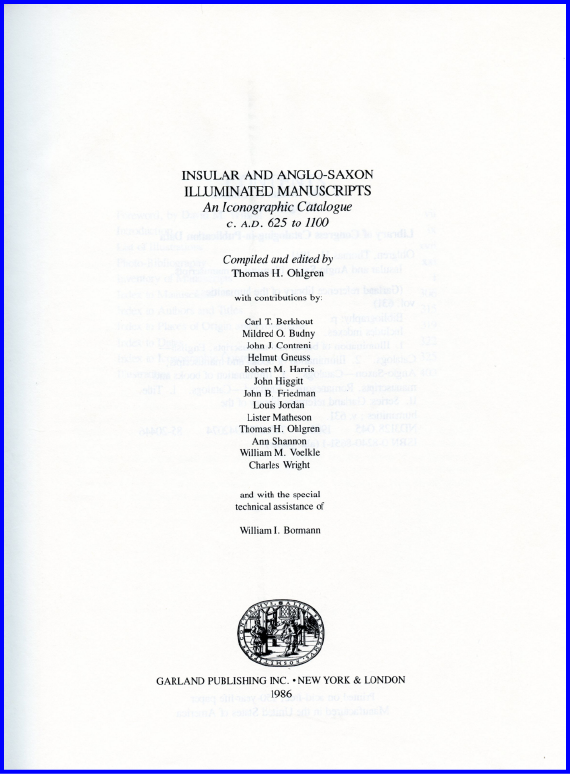 In book form, it appeared as Insular and Anglo-Saxon Illuminated Manuscripts: An Iconographic Catalogue, C. A.D. 625 to 1100, compiled and edited by Thomas H. Ohlgren (1986), with contributions by many scholars. 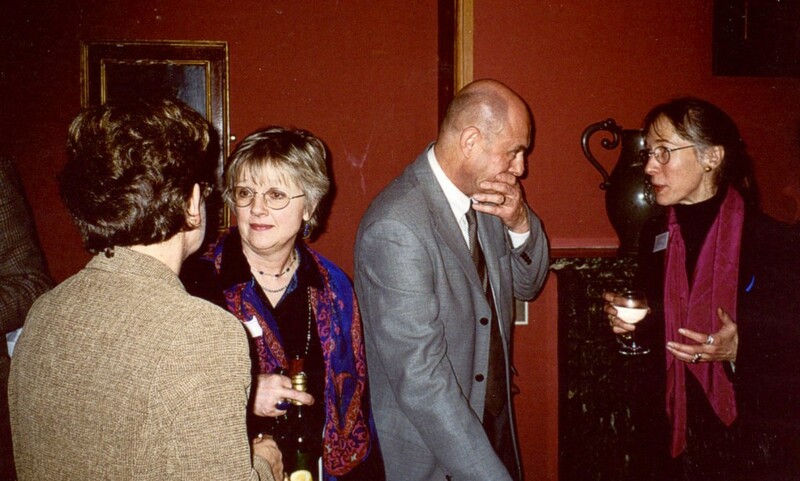 By the time of the Colloquium, the project — with Mildred Budny’s permission at Tom Ohlgren’s request — had by 1996 changed its name, inspired by the title of her then-still-forthcoming Illustrated Catalogue (1997). 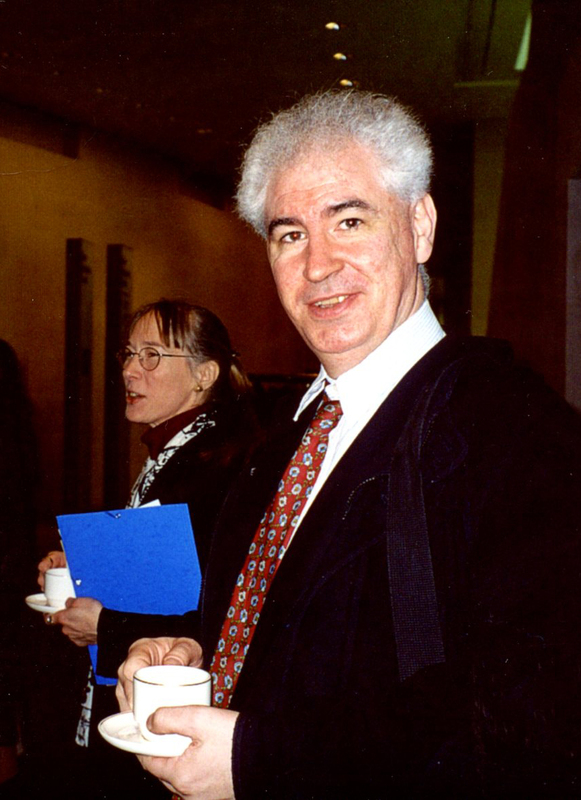 The CORPUS Project Abstract, prepared by Thomas Ohgren and Mildred Budny in late 2002, was circulated as a handout at the Colloqium, and now can be downloaded here. 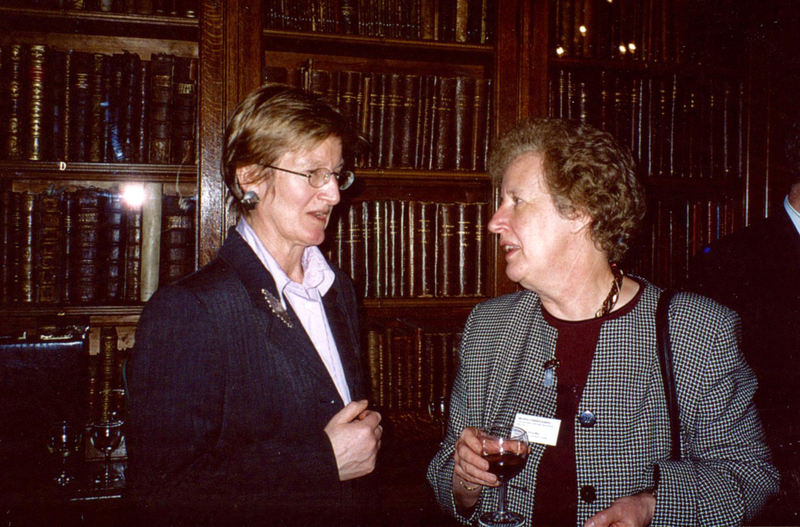 A Report of the “Contributions by the Research Group on Manuscript Evidence” to the project in earlier years was presented by Mildred Budny at the 1993 Congress and published in the Old English Newsletter, Volume 23, Number 3 (1993), A-8 – A-23, now online. By the next year, the revised and expanded HyperText version (Release 1.0) of CORPUS had appeared (1994), followed by further updates behind the scenes over the succeeding years leading to the Project Abstract as presented at the Ohio State Colloquium. 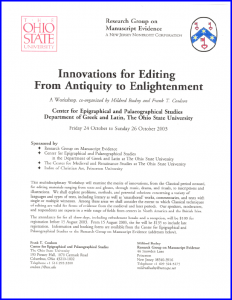 This Colloquium/Workshop expanded the subject of one of the Sessions sponsored by the Research Group at the 2003 Congress in May. 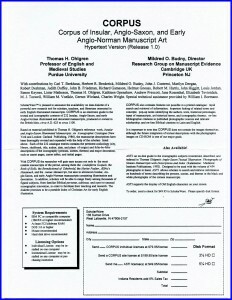 the design of its official Website in its first version: http://www.manuscriptevidence.org/data/ (launched in 2006). 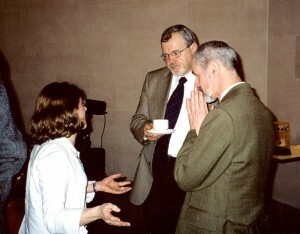 the 2009 Anniversary Symposium on “Gathering at the Threshold” at Princeton University. More of them followed in time. See the New Series. At the 2003 Congress, the Research Group on Manuscript Evidence sponsored one Session. As customary, some Trustees and Associates of the Research Group participated in the Congress in diverse ways. 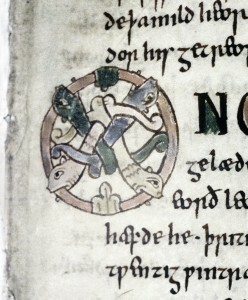 Bodleian Library, Tanner MS 10, folio 38 recto, detail. 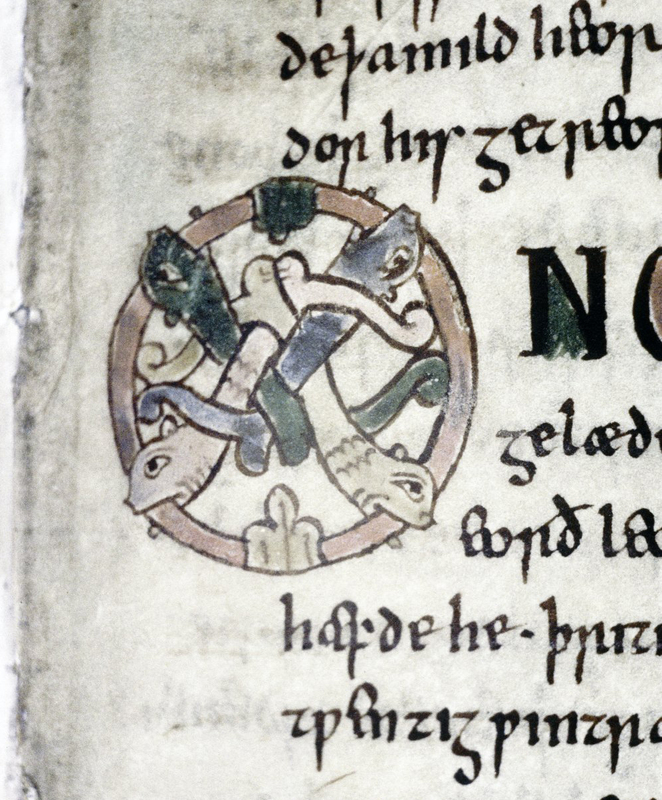 Photo: © Bodleian Library, University of Oxford. 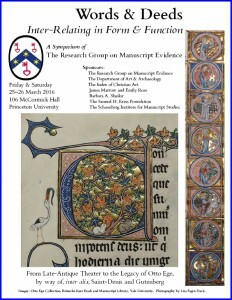 This is the first year that the Research Group resumed the tradition of sponsoring Sessions at the Congress since 1993, although with an appearance for Receptions at the 1997 Congress to celebrate the co-publication of the Illustrated Catalogue of Insular, Anglo-Saxon, and Early Anglo-Norman Manuscript Art at Corpus Christi College, Cambridge. The activities during the intervening years occupied our energies in establishing the new base and a focus for activities in the United States. Some more Publications and Events included. But now we could return, stronger than ever. 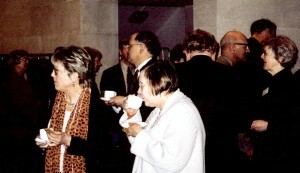 Since 2001, the Research Group has jointly sponsored scholarly meetings, co-organized by Mildred Budny and held at various centers in the United States and elsewhere. 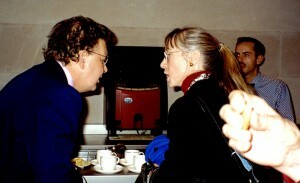 These meetings constitute the ‘New Series’ of Symposia, Colloquia, Workshops & Seminars (2001–). 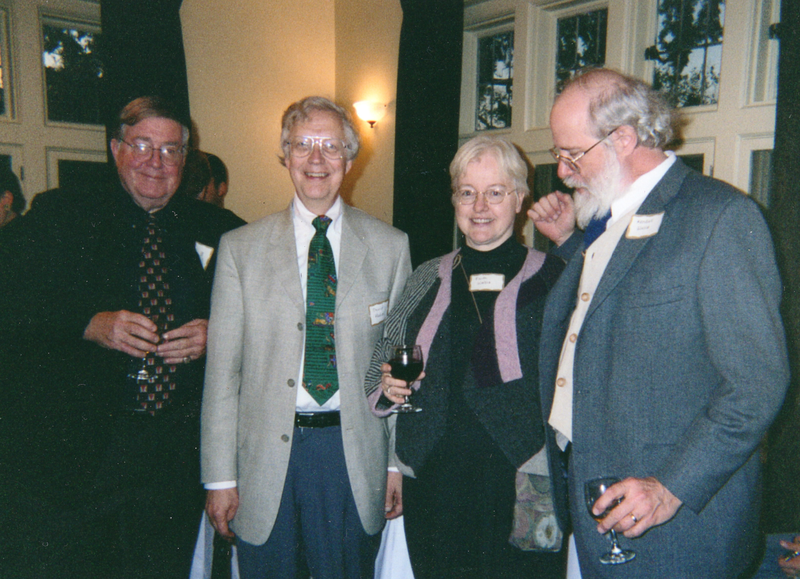 Following the move of our principal base to the United States in October 1994, the ‘New Series’ began with the Annual Symposia on “The Transmission of the Bible” (1995–2000). 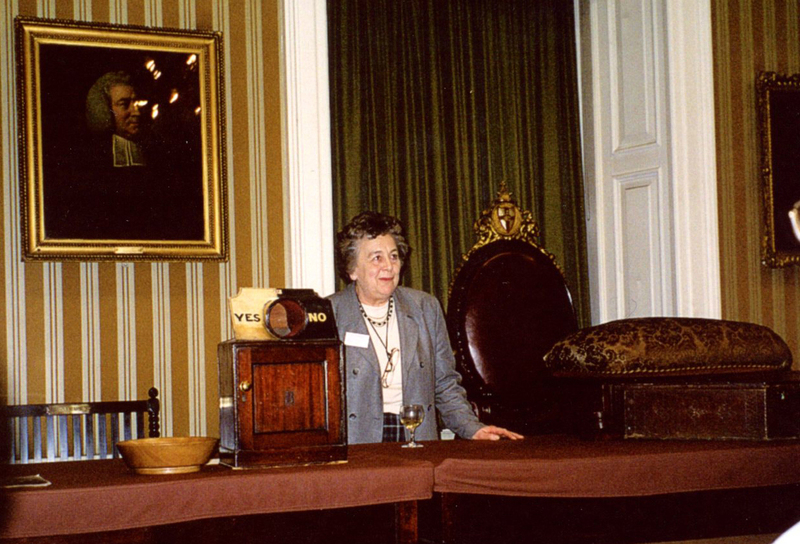 Then it moved to events devoted to various topics, biblical and other subjects included. 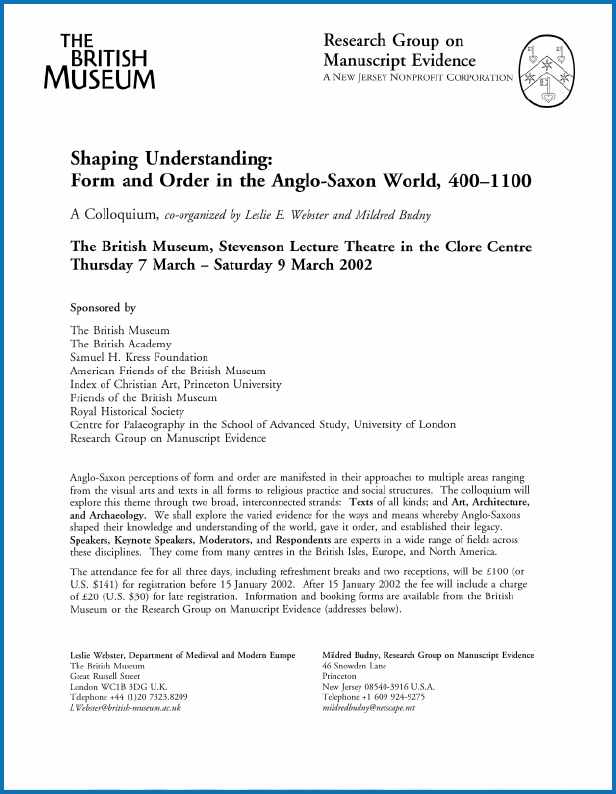 Among them: “Form and Order in the Anglo-Saxon World” (2002) at The British Museum. Front Entrance to the British Museum on 10 March 2002. Photograph © Mildred Budny. the recognition for the Research Group on Manuscript Evidence of tax-exempt status as a Section 501(c)(3) nonprofit organization. 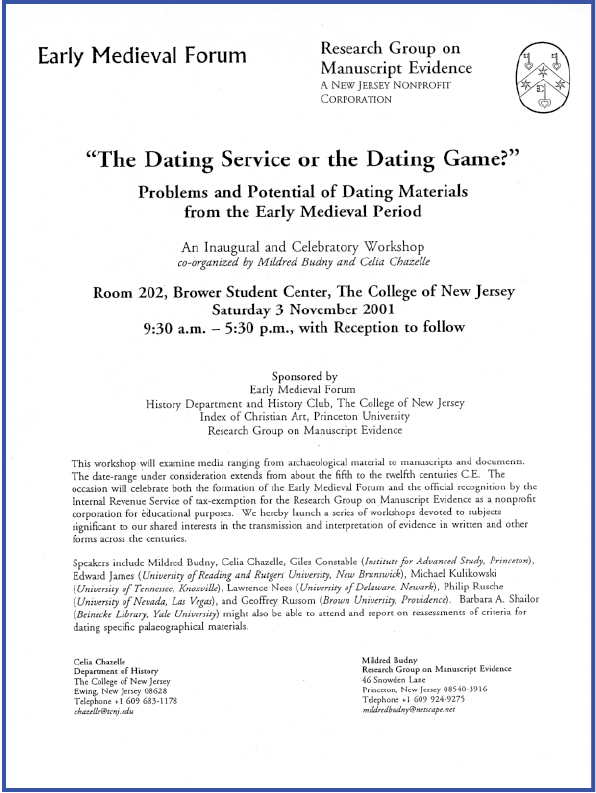 Co-organized by Celia Chazelle and co-sponsored by the Early Medieval Forum, the Index of Christian Art of Princeton University, and the History Department and History Club of The College of New Jersey, the Workshop was held at The College of New Jersey, Ewing, New Jersey, in November 2001. 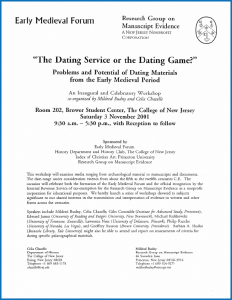 Information about the interests, activities, and listserv of the Early Medieval Forum appears on its website: Early Medieval Forum. Information about this Workshop appears on its own page. Next came the British Museum Colloquium, which extended across 3 days in March 2002. Besides co-organizing the event, the Research Group prepared the printed announcements, Poster, Booking Form, Program, and Booklet containing the “Abstracts of Papers”. All are set in Adobe Garamond and laid out according to our Style Manifesto. 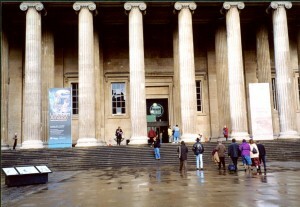 The Colloquium was held at the Clore Centre of The British Museum in London in March 2002. 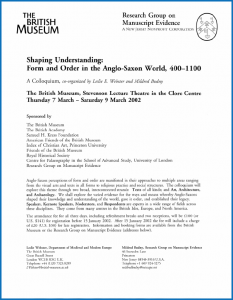 Anglo-Saxon perceptions of form and order are manifested in their approaches to multiple areas ranging from the visual arts and texts in all forms to religious practice and social structures. 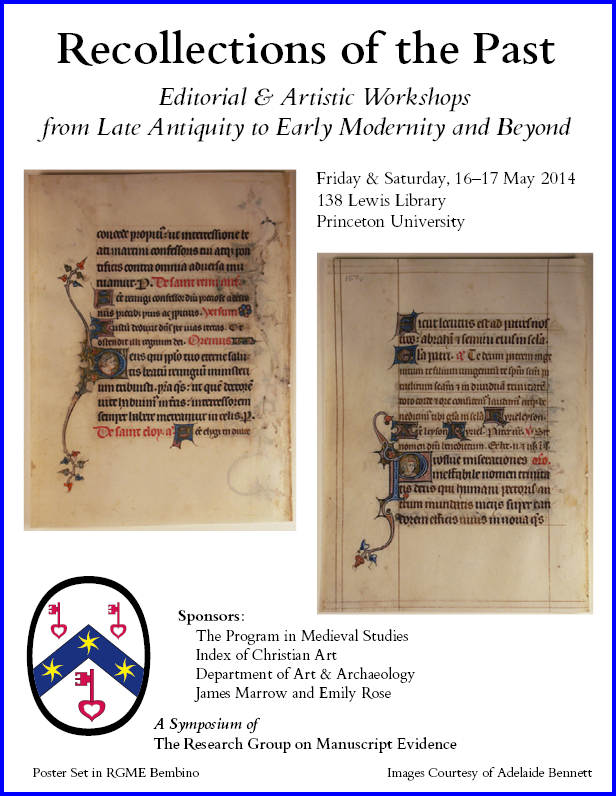 The colloquium will explore this theme through two broad, interconnected strands: Texts of all kinds, and Art, Architecture, and Archaeology. 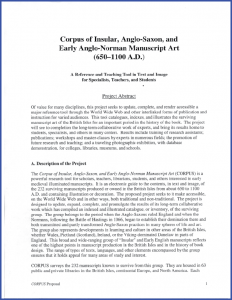 We shall explore the varied evidence for the ways and means whereby Anglo-Saxons shaped their knowledge and understanding of the world, gave it order, and established their legacy. Speakers, Keynote Speakers, Moderators, and Respondents are experts in a wide range of fields across these disciplines. They come from many centres in the British Isles, Europe, and North America. The 5-page Program lists the order of the proceedings, refreshments and receptions included. 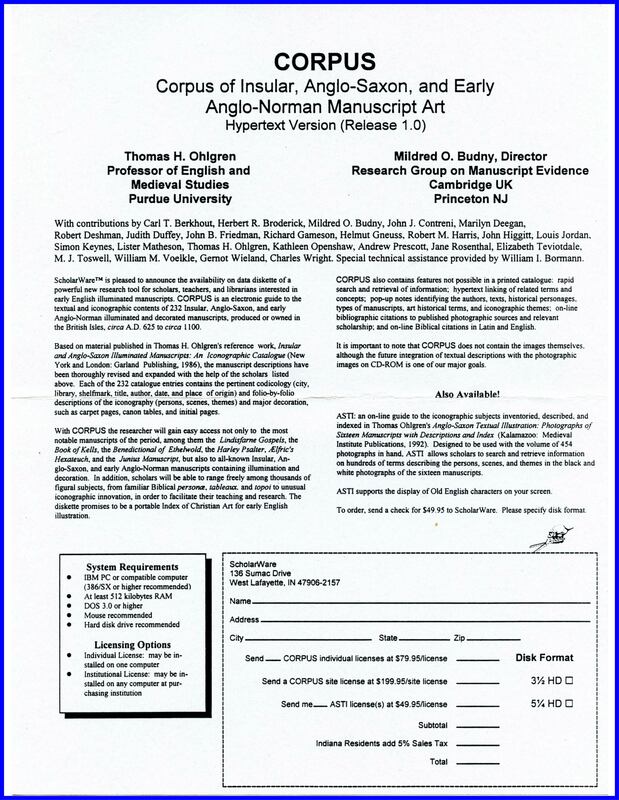 The 14-page Booklet provides the Abstracts of Papers. We include both of them here. Abstracts of the thirty-three papers presented at the Colloquium were published in print for distribution at the Colloquium. 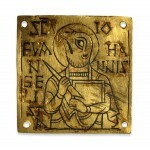 They are also available online, as described in the list of Publications. 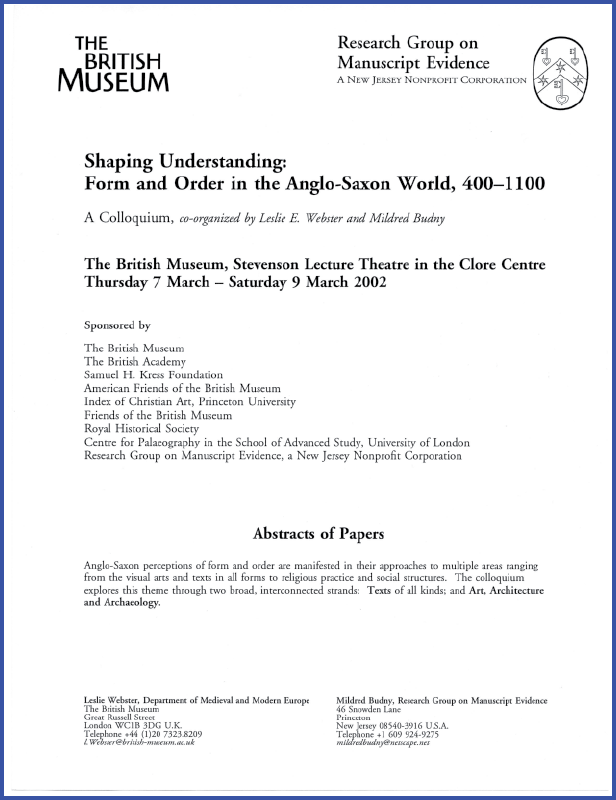 The Abstracts alone, without reference to the Research Group (which provided their texts), were reprinted in double-column layout in the Old English Newsletter, 35:3 (Spring 2002), A-5–A-15, and now available online. 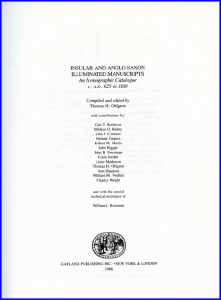 The Abstracts of Papers [compiled and edited by Mildred Budny] appeared as a Booklet of 14 quarto-size pages, laid out in single columns in Adobe Garamond (Princeton: Research Group on Manuscript Evidence, 2002). Distributed at the event, and circulated afterward, it is now available for download on our site. The Index of Abstracts of Papers for Events Listed by Year cites the Authors alphabetically for this and other events in the New Series. 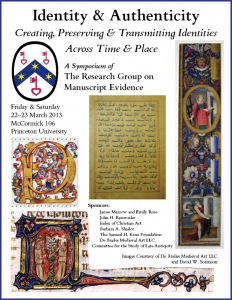 The Indexes of the Abstracts for Congress Sessions lists the Authors both by year and by name. We thank the Organizers, Hosts, Sponsors, and Contributors. The photographs of the event reproduced here were taken by Geoffrey Russom and Mildred Budny. 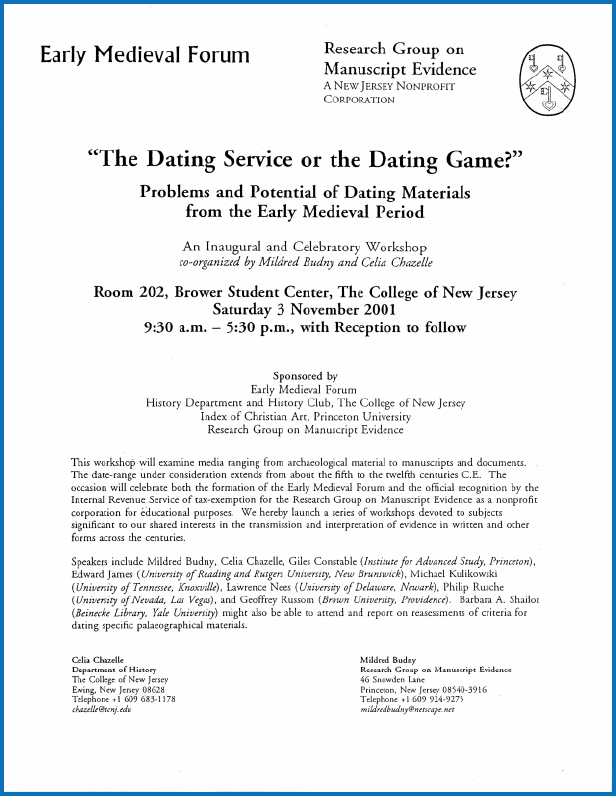 Some of the Contributors to the 2001 Dating Game Colloquium and the 2002 British Museum Colloquium also participated in this Colloquium. More events continue to follow. 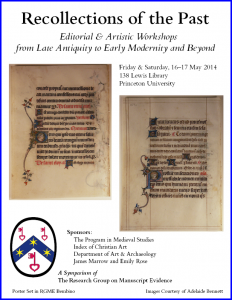 Have a look at our Symposia, Colloquia, Workshops & Seminars. Please see also our News & Views. 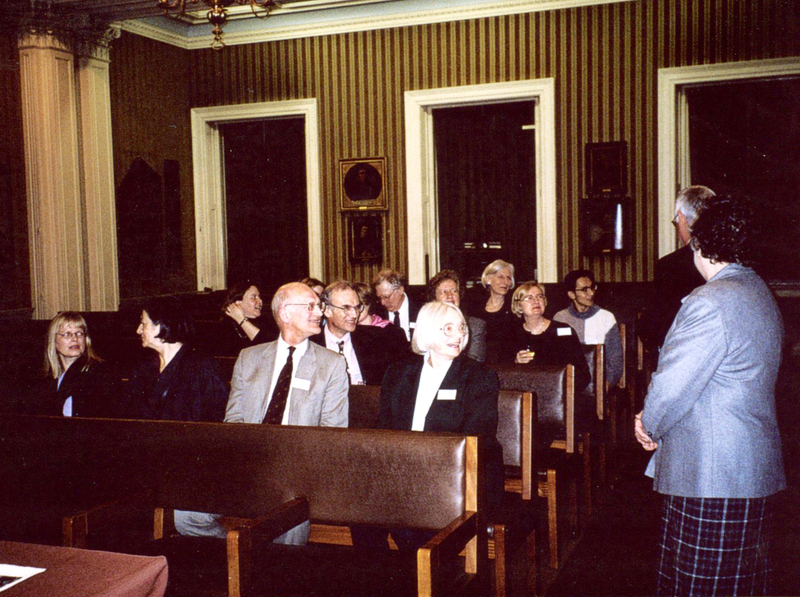 Annual Symposia on the Transmission of the Bible (1995‒2000). 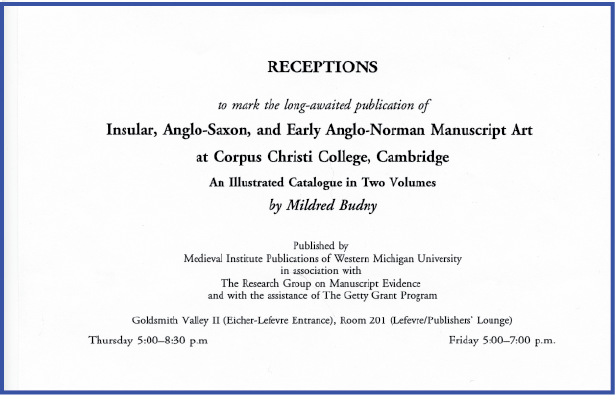 In this year, the two-volume Illustrated Catalogue of Insular, Anglo-Saxon, and Early Anglo-Norman Manuscript Art at Corpus Christi College, Cambridge, was published in time for distribution at the Congress and for a series of Receptions there to celebrate the “Cast & Crew” responsible for its collective achievement. Book-signings continued also at other stages during the Congress, as the author (also the Director of the Research Group on Manuscript Evidence) delivered copies to colleagues who had responded to the special pre-publication discount, and had chosen to collect them on site. A happy time! 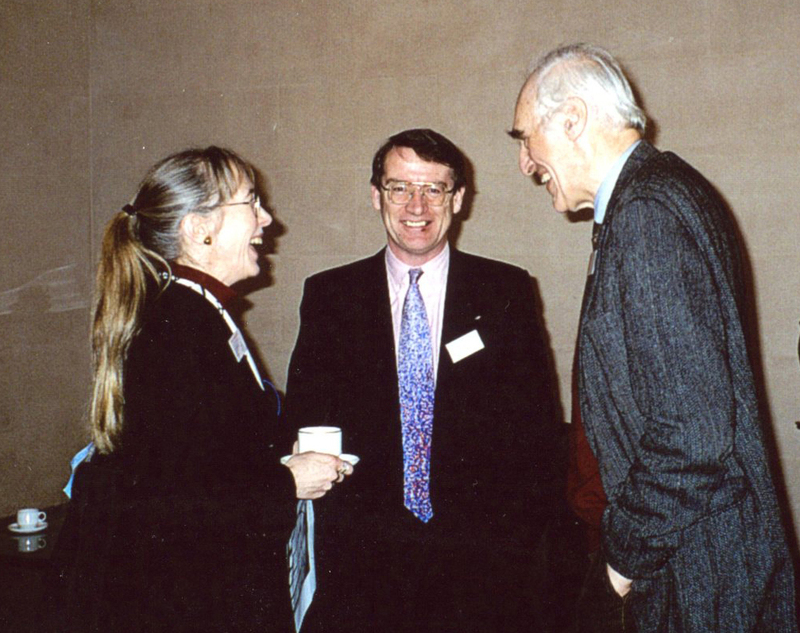 At the 1995 Congress, the Research Group on Manuscript Evidence sponsored one Session. 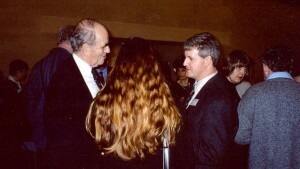 This appearance followed from the preparations already in hand for a transfer to the United States, as described in the 1994 Congress. 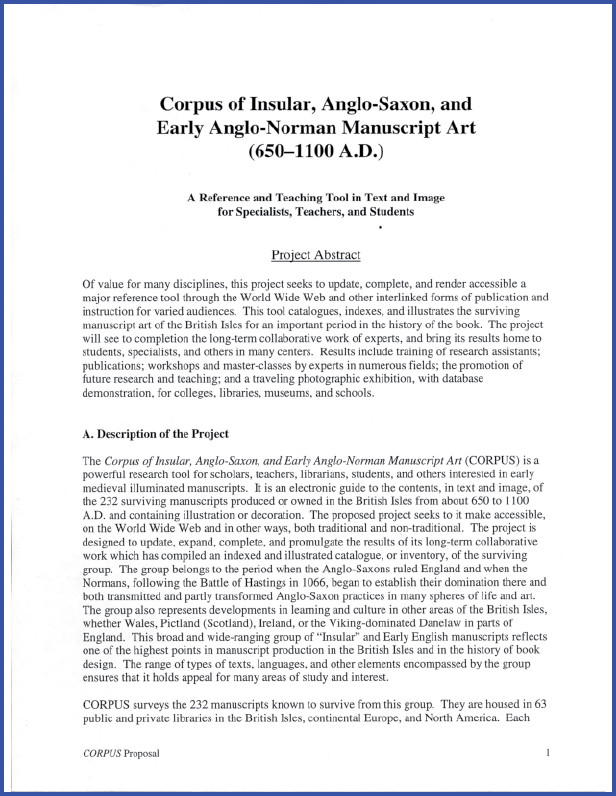 During the months following the 1994 Congress, and with the completion in October of the long-term Research Project on “Anglo-Saxon and Related Manuscripts” at Corpus Christi College, Cambridge, from which the Research Group on Manuscript Evidence had emerged, the Research Group moved its principal base to the United States — however, unexpectedly, to Princeton. 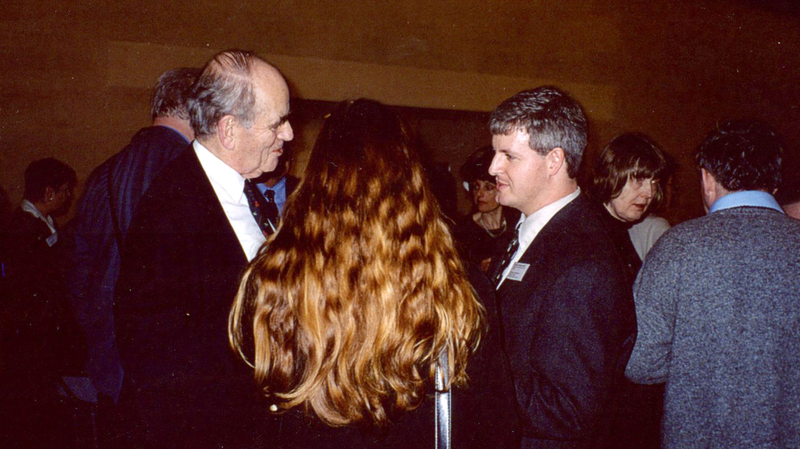 Its participation in the 1995 Congress represents its first appearance there as an organization based in North America. The developments from this transition are recorded overall in our website. This Session set the stage.